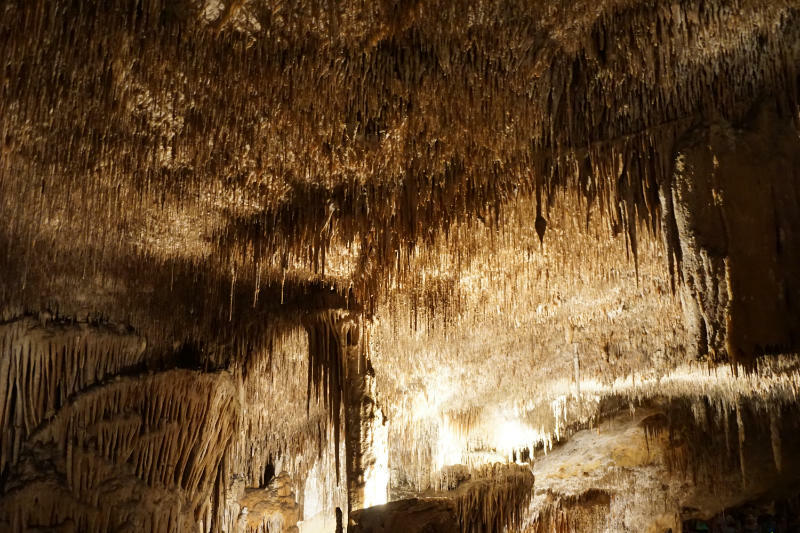 An absolute magnet for tourists on Majorca is the Cuevas del Drach, the dragon cave. 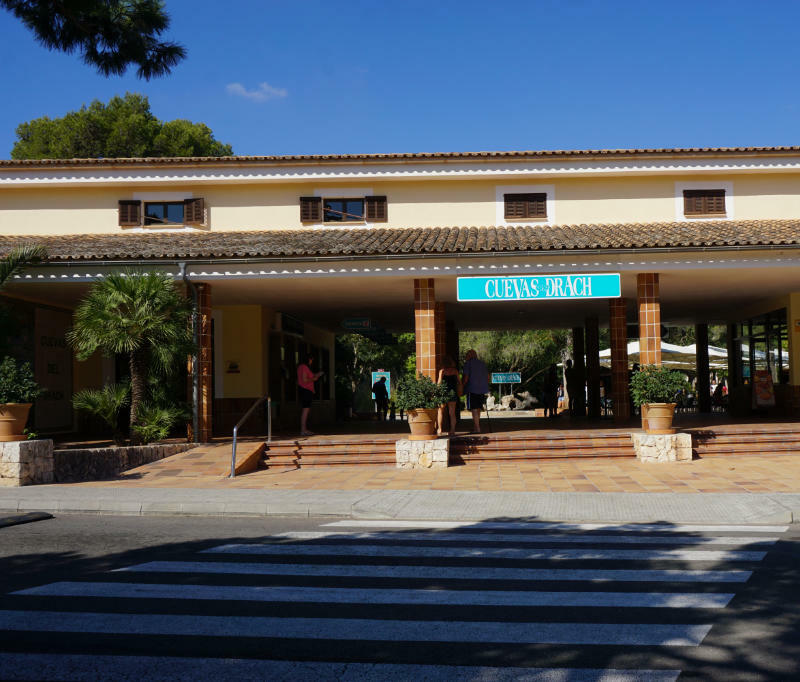 It is located in Porto Cristo and we liked it a lot. 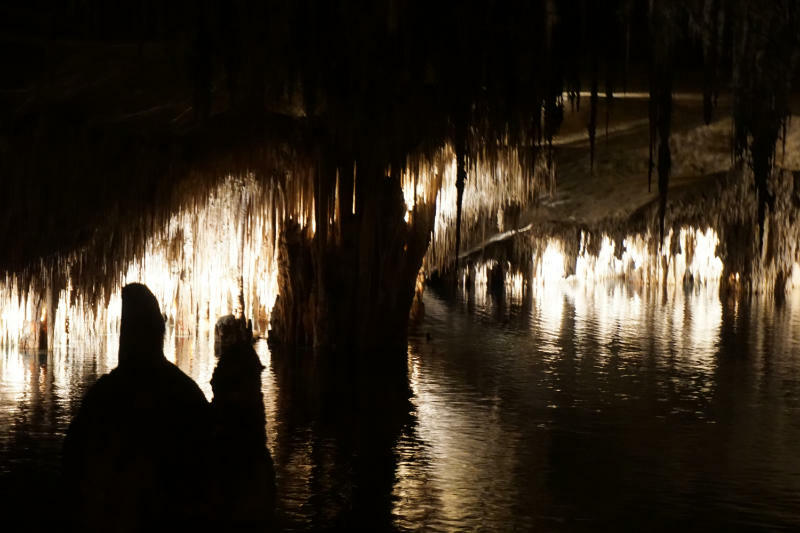 Visitors of the Cuevas del Drach should really book their tickets online in advance. There are tours that start hourly and in my opinion, they let too many visitors in at once during these time windows. Still, there are very long queues at the ticket offices and the hourly tours do sell out. 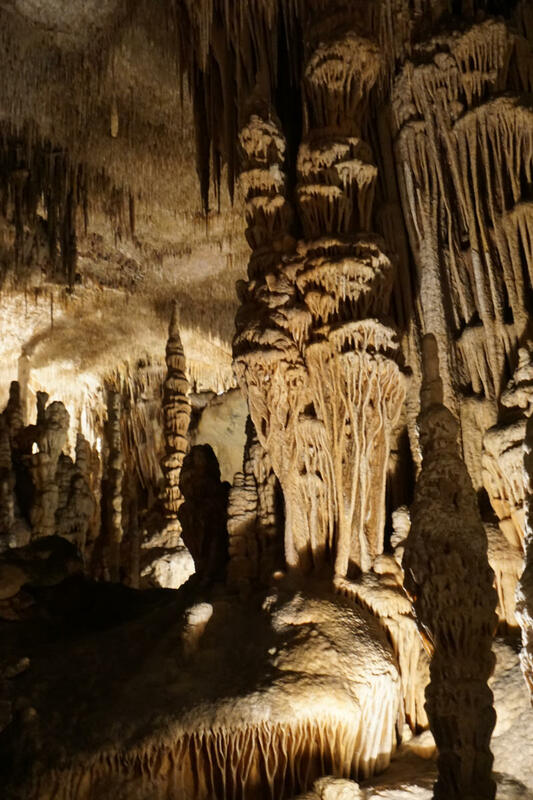 We decided to visit the dragon cave the night before and booked online, completely hassle-free. There are many signs leading to the caves but be careful with those since there is another cave in Porto Cristo that can be visited. Ample parking is available at the caves and it is free. Once every hour a huge number of visitors are let into the dripstone cave at once. My tip: Take your time! Many visitors are almost storming the cave without even looking to the right or the left. But the natural spectacle that they were missing out on was impressive. Unfortunately, there is no further information on the formation or discovery of the cave but I read up on it in my own time. 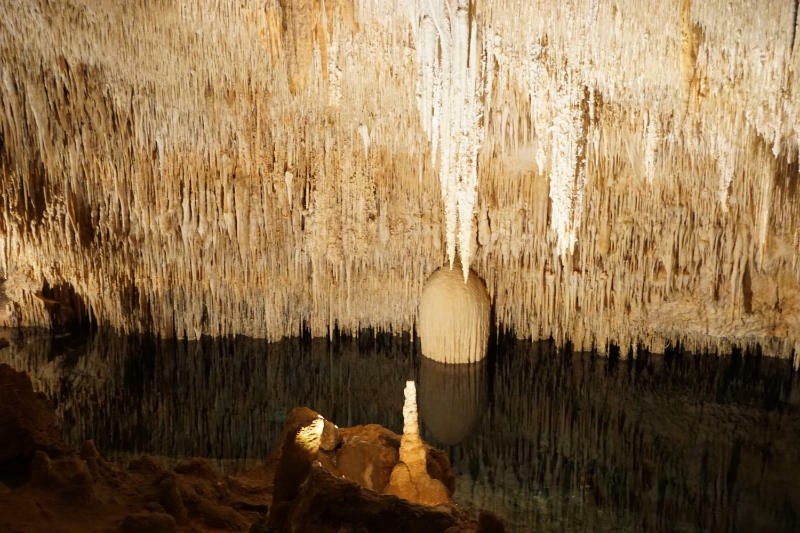 The Cuevas del Drach are known since the medieval. Legends were passed around for long times about pirates and templers hiding their treasures here and how a dragon guarded them. In 1339 some soldiers were sent into the caves to retrieve the treasures and this marks the beginning of the exploration of the caves. In 1922 Majorcan Joan Servera Camps bought the area around the known entrance to the cave. According to former laws, he was now also the owner of the caves. The first visitors were able to walk secured paths in the caves in 1935. A proper entrance, staircases, paths and a lighting system were installed. The light really brings out the natural beauty of the dripstones. The temperature in the caves is at a constant 21 degrees Celsius with 80% humidity. Today’s visitors have around an hour to walk the 1200 metres along the path to the subterranean lake Lago Martel where a concert with classical music (10 minutes long) is played for them. We enjoyed the walk to the lake where the concert is held a lot. Taking pictures is permitted without flash or tripods and we made use of that. The stone formations are astonishing and the lighting gives one the impression to be in a fantasy world. Once at the lake the visitors are invited to take a seat. The rows of chairs are quite narrow and here one has to wait until even the last visitor made it to the lake. A bit unfortunate for the faster visitors. We didn’t have to wait for long once we arrived. At this point filming and taking pictures was no longer permitted. The cave became pitch black and boats appeared on the lake, lit up and very slowly floating along. Sat on one of the boats were the musicians who started to play classical music. Wonderful! After ten minutes the performance was over and visitors got to decide whether they wanted to get on one of the boats with about ten others for a 100-metre ride across the lake or whether they wanted to walk along the lake for some more. We decided to walk and then continued to the staircase to make the climb up to the exit. I enjoyed the visit to the Cuevas del Drach a lot. This natural spectacle is unique and quite a sight. However, the number of people that get herded through the caves at once is far from ideal. Smaller groups with more information would make for a far better visitor experience. The caves are not accessible for mobility device users / people with disabilities!